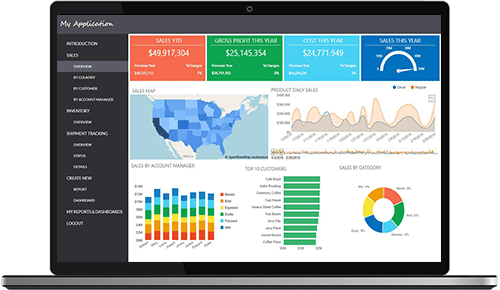 Seamlessly integrate reporting, dashboards and visualizations into any application. Empower your business users to work more efficiently with relevant, in-context information and interactive tools for exploration. 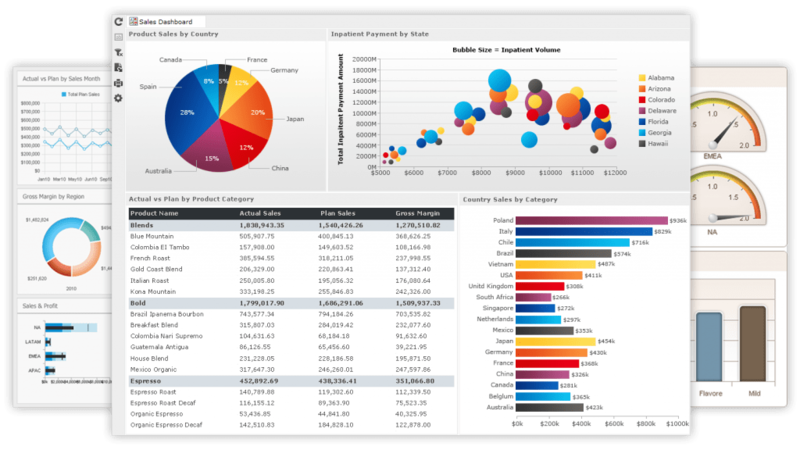 Quickly and securely embed rich charts, reports and dashboards into your software application. 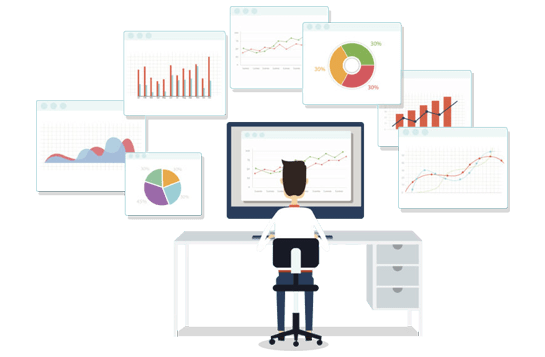 Embedded analytics with JReport gives you full control over the functionality as well as the look and feel that can be configured to match your application. Let JReport do the heavy lifting of analytics while you focus on your application. The ability to enable end users to interact with different report views dynamically. Enables report developers to create and distribute reports to end users. Pre-defined key performance indicators used to monitor business processes and objectives. The ability for a user to create a report at any instance on a whim, and present information for analysis and discovery of insights. Obtaining actionable information by finding patterns in data from one or more sources with interactive visual analysis. The ability to customize every part of the embedded analytics application to match the look, feel, and business logic of the host application. Business intelligence is a set of tools, methodologies, and processes used to analyze data for use in data discovery and decision support. Some BI technologies include reporting, dashboarding, visualization, data discovery, as well as many others. 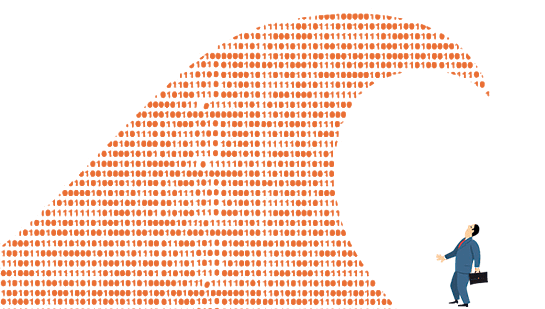 The main focus of traditional business intelligence is to use aggregated data from multiple systems, usually organization-wide or across several departments. 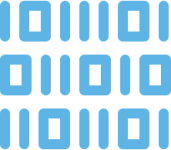 Traditional BI platforms typically present data from separate applications and systems. The difference between traditional BI and embedded analytics is the context with which the data is being analyzed. Embedded analytics integrates the capabilities found in a BI platform into users’ systems and applications. Simply put, users want to see the data analytics that is pertinent to their daily tasks from within the applications they use. They don’t necessarily need to see a high level view of all the information across the entire business, nor do they want to navigate between your application and a separate tool. They want to explore their data to gain a better understanding of where they can improve efficiency and immediately gain actionable insights. 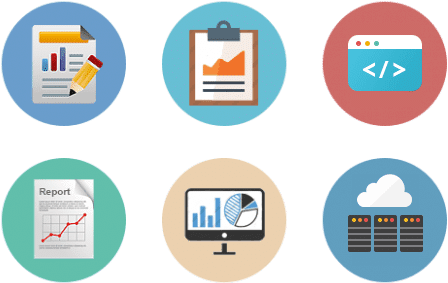 Why Embedded Analytics with JReport? Give your software application the power of reports, dashboards, and data analysis. Your users will gain valuable insight into their data with the added value of interactive data visualization. Developing a homegrown solution often takes the focus away from your application’s core capabilities. With a low total cost of ownership, JReport is robust and customizable giving your users a streamlined experience. Many applications only provide basic reporting and a limited library of charts. Providing more advanced, yet easy-to-use analytics in your applications can result in greater value for your end users. Embedded analytics ensures that anyone can analyze data insights with ease. Enable non-technical end users, analysts, and developers to explore the available data in your application. JReport is easy to integrate. As a result, deployment times are much shorter than deploying and embedding traditional business intelligence tools. Your application will look and feel as if the analytical capabilities were seamlessly built-in. JReport enables you to embed powerful analytics capabilities inside your SaaS applications. JReport can be rapidly deployed on private and hybrid cloud environments, or public cloud environments such as Amazon Web Services and Microsoft Azure. A multi-tenant architecture enables tenant administrators with fine-grained management of their own resource, security, and user policies ensuring tenants are secured and isolated. Embed JReport into your own software applications or as part of the product offerings you provide to your customers. JReport embeds seamlessly into your application by providing the capability to match the look and feel of your application UI in the front end and your business logic in the back end. Your host application can both control and interact with JReport. Analytics will work like an integral part of your application. Leverage extensive APIs for full interactive control of reports and dashboards from within your application, removing the boundaries of the embedded analytics. The analytics effectively blend into your application in a seamless way. From small installations to large, multi-tenant environments, JReport’s embedded analytics architecture lets your deployment grow as you scale. Our flexible architecture scales to meet peak demand times with node expansion and clustering technologies for load balancing and failover capabilities. Provide highly available, efficient, scalable analytics to your users. Build and embed your data visualizations and provide your users with the ability to explore and analyze data in a timely, actionable manner. 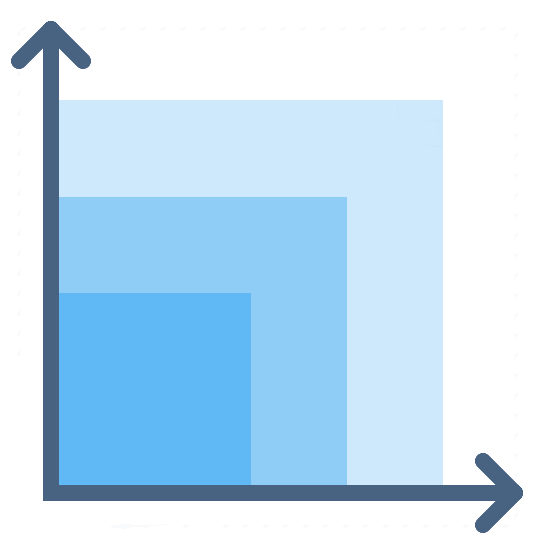 Dashboards and reports are created by simply dragging and dropping in charts, tables, crosstabs, and other special components from a component library, all with little to no IT involvement. A complete BI solution in one package. JReport delivers embedded reporting, dashboards and analytics functionality in an all-in-one integrated platform. Choose what features to integrate and how to integrate them through various integration options. Security is the foundation of the JReport embedded analytics product suite. 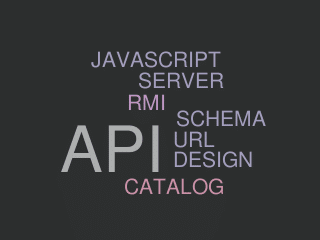 JReport provides a fully secured system from the metadata all the way up to the final visualization. JReport provides access control to visualizations by applying different security policies, including member, record and column-level security. Member-level security limits user access to the specific members of a dimension. Record and column-level security defines which records and table columns are revealed to any given user. JReport provides a built-in realm management system by default. The security settings and specifications from an external security system, such as LDAP, can be easily imported to integrate with JReport’s security system. MasterControl is a leading global provider of enterprise quality management systems (EQMS) and quality and compliance consulting services. MasterControl needed more advanced analytics and data visualization in their quality management systems to help meet growing customer demands. MasterControl partnered with JReport to update its analytics technology. With JReport they’ve been able to empower their quality management system users with more advanced analytics. RM Education specializes in the use of technology in the UK education market. One of our most popular products is RM Integris which is a cloud-based management information system (MIS) for schools. RM Integris is used by more than 2200 schools and brings together a school’s assessment, attendance, behavior, pupil and staff data into one system. It provides a powerful suite of intuitive tools that enable schools to easily manage their data and then analyze it to identify trends which in turn help to inform school strategies for change and improvement. RM Integris holds a massive volume of data so they were looking for a tool that had the versatility to combine different data items in a variety of chart and table formats. It needed to be really intuitive and easy to use as school staff don’t have much time to spare. They needed something Java based so they could customize it and they needed simple APIs to utilize and integrate into their product. Some of the information held by schools can be sensitive information, so they also needed 100% reliability. The General Services Administration (GSA) is an independent agency of the US Government that helps manage and support departmental functions of US federal agencies. The Federal Acquisition Service (FAS) is one of the agency lines it’s responsible for. The FAS is responsible for providing the most cost-effective and modern solutions to all agencies of the US government. The GSA/Federal Acquisition Service required an analytics tool that could be easily embedded into an application used to support their daily internal operations. Mainly, the FSA required reporting that could visualize data on the procurement and lifecycle management of government vehicles from managing budgets, to placing orders, to managing vehicle disposal at the end of the vehicle’s life. JReport enabled FAS to deploy a solution “out-of-the-box”, with an very short lead time for implementation which was ideal for the projects needs. Ready to Get Started with JReport?